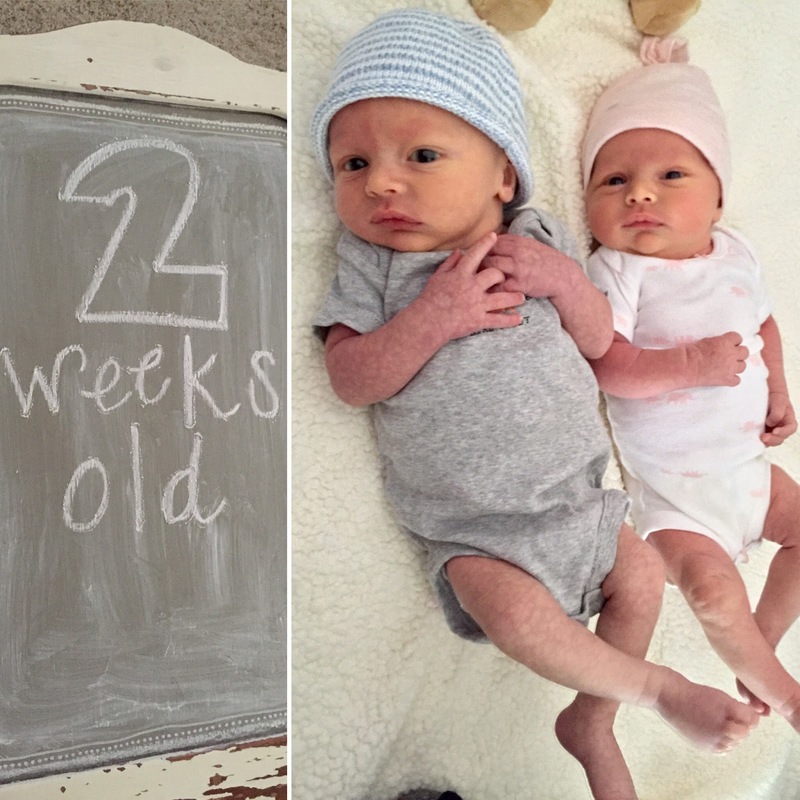 It's so crazy to me that the babes are already 2 weeks old! They say that times goes fast- and while I do agree with this- I also think the days go by pretty slow... and I'm okay with that. They will only be newborns once and I am always reminding myself to not wish this time of sleep deprivation and exhaustion away. Before I know it, Alex and I will be moving those little cribs out of their room and finding toddler beds. I just know it'll happen in the blink of an eye. Bailey's and coffee with my best friend! It was so cold out but we still wanted to walk around the plaza and enjoy being outside, as crazy as that sounds. We took newborn pictures last weekend and once I get them back we will definitely share but it was one of our first big outings with the babes. We LOVE our photographer, Rachel Moore. She shot our wedding and so it's even more special that she will see these two grow up and watch our family get bigger and bigger. Since we are such KC people, we obviously had to get a Charlie Hustle picture. After pictures, we went to lunch at the new QDoba in Mission and had planned on going through the drive thru but when they didn't have one, we decided to take the babies out for their first restaurant experience. They were amazing. Slept the whole time and we got to enjoy. It was a good reminder to us that we can still do normal things with them! We are obviously on a schedule but still it's nice knowing we do have some flexibility to break and have lunch. After, we went home, had another feeding and geared up for the babies first trip to Church! They were studs. Church goers! We sat in the very back row, just in case. Alex went back to work this week. THAT was a hard morning. He told me it was the hardest thing driving away from the house, and it wasn't any easier for me to see him leave. I definitely had some rough moments that first morning. I realized I hadn't been apart from him for more than an hour since he left for winter break! Almost a month! He knew everything I needed, the babies routine and schedule, where everything was in the house and knew how to comfort me in the ways I needed in these crucial first few weeks. But I'm glad that he's back working and around such a great community at St. James Academy. I know we have so much support there and I can't tell you how great it feels. I've had help every day this week, as my incision site continues to heal. Becky, Alex's mom, came Monday. My two friends Olivia and Kristin came Tuesday. My mom Wednesday, sister today and Alex's grandma Joan will come tomorrow. It's been great to have such support, especially this first week Alex is gone. Kristin had an interesting experience with Emmy and some explosive poop with one of her diaper changes. Oh the life of newborns. Eating, pooping and sleeping. HUGE thank you to everyone who came by to help and for the beginning of the meal train! It's been amazing to not have to worry about cooking for ourselves- we've been able to spend what little time we do have in between feedings to cuddle with the babes. Even though it's only been their first couple weeks in this big world, Emmy and Bennett have already shown us their very different personalities. Bennett is, as I thought from the womb, a very calm little man... unless he's hungry. But even then, he remains pretty composed until we can get the bottle to him. Again, just like in the womb, he always has his hands by his face. It comforts him I guess! He's a very messy eater but knows when it's time to eat and often reminds us for the both of them. He makes the best facial expressions, especially when he's concentrating. Just like his dad, he furrows his brow and looks determined to finish whatever he's doing (which, most of the time, is finishing a bottle). Hanging with mom.. I love how much he looks like Alex. My little fiesty girl. She is famous for her poops, as her dad says. We change her and less than a minute later, she dirties it again. She loves those new diapers. She loves having her arms and hands on Bennett's face and nestling as close to him as she can get. Just like in utero, she loves to stretch out and take up space, and Bennett seems to not mind. She's my noisy eater, making it known that she's in the room. She is a great sleeper and has to almost always be woken up to eat after Bennett cries and alerts us it's time. Tutu from France courtesy of Auntie Sarah! It's a little big but she loved it. She looks pretty tough in pink! Our first night home was... interesting. Alex and I quickly realized that if we didn't have some sort of game plan and schedule that we would be in trouble. We were still sleep deprived from our hospital stay and so it just carried over to home. Except we didn't have the NICU nurses to back us up when we needed a break. I'll be honest... the feeding every 3 hours is absolutely exhausting. I was tandem breastfeeding them in the beginning but it got frustrating. It was so hard to make sure they were both latching correctly and it was hurting me when they didn't fully latch. If this was the case, they would not get full and after breastfeeding for more than an hour, they would still be hungry. So Alex and I knew something needed to change. 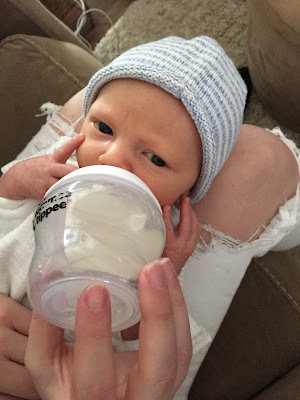 I started pumping more and we have been bottle-feeding my breast milk exclusively. I pump every three hours and that supplements the next feed. I now know how much they are getting and that they are full after a feeding, rather than wondering. We also have Enfamil formula to supplement, just in case. We're pretty lucky that they aren't picky between breast milk, formula, bottle or breast. It's good because I think our kids are going to have to be pretty flexible in life, especially with our schedules. For those future mommies of twins out there, I thought I would jot down a normal day for us now, in the early days of being home. Routine is everything and I think having someone else's routine to look at and try is always good. But also remember, what works for us may not work for you. I've read blog after blog trying to find ideas for routines. Some have worked and some have failed. It's all about trial and error, unfortunately. 6am: Everyone up; Alex gets ready for work. First feeding of the day! I change them first to wake them up and get their bottles warmed up. Once they are fed and clean, I pump and all three of us nap until the next feeding at 9. 9am: Feeding, change and try and lay them back down for sleep. Then, I pump. It does start to feel like I'm a milk machine. I'll try and nap here after making sure I have clean bottles and breast pumping stuff. Noon: You guessed it. Feed, change, bathe, if needed, and play time. I try and keep them up for a little longer here. If they seem sleepy still, I'll use this opportunity to nap, or possibly slip in a shower when I have someone here with me! 3pm: Alex comes home between 3-4 and so by now the day already has flown by. I change, feed and wrap them back up for another snooze. That way when Alex gets home, he can sneak a nap in before the nighttime routine. 6pm: In between this feeding and the last, we sometimes eat dinner but normally Alex naps and I use the time to get some things around the house! Normally I just leave the housework and don't worry about it but some things just have to be done. We feed, change and then they sleep. That's pretty much a staple- I can't believe how much newborns sleep! 9pm: Feed, change and get ready for bed! Alex and I try and get in bed by 10pm if we can. That way we can try and get a few hours of sleep before the midnight feeding. Midnight: Alex has been taking this feeding and change. I get up around 2 to pump and get ready for the 3 am feeding. 3am: Feed, change and pump for 6 am feeding. Normally in bed by 4:30 or so. This is the time of night when they are sometimes little hooligans and want to stay up. Of course when it's hardest for mom. 6am: Alex and I both get up. I start the change, feed routine and he showers after getting me started. He leaves the house around 7:15 and we start all over again. This works for us right now. We are still tired and still trying to get this whole parenting thing down but our babies seem to be growing! I can feel them getting heavier and they go through more diapers that I thought- which is a great sign they are eating well! I hope you all can meet these two soon if you haven't already! They are pretty fun, but I'm biased.